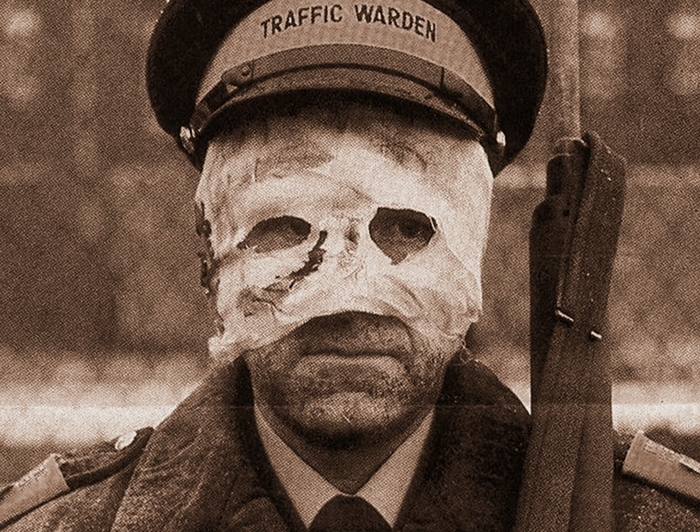 Directed by Mick Jackson (L.A. Story, Denial) with a screenplay by Barry Hines (Kes), the landmark British television film Threads shocked viewers in 1984 with its chilling, brutal depiction of a nuclear winter in Sheffield, England. Produced and released during a particular volatile era of the Cold War -- and one that brought no shortage of like-minded dramatic films, including Nicholas Meyer's The Day After (due for Blu-ray release from Kino very soon), Testament, Barefoot Gen, and When the Wind Blows -- Jackson's film staunchly refuses to turn away from the horrific, lasting effects of nuclear fallout. Threads is, unsurprisingly, an extremely tough watch and one of the hardest films I've had to sit through in several years. It does an outstanding job of building tension during the first 40 or so minutes: we're first introduced to Ruth Beckett (Karen Meagher) and Jimmy Kemp (Reece Dinsdale), young lovers looking towards the future they'll be sharing after an unplanned pregnancy. Along with their respective families, Ruth and Jimmy have the uneasy feeling that mounting tensions between American and Soviet forces may lead to full-scale nuclear war, while the constant presence of news stories and protests only deepen their worst fears. Days tick away with false alarms, emergency preparation warnings, voluntary evacuations, and looting in the streets. Before long, disaster strikes: a nuclear warhead explodes only kilometers away, virtually erasing millions of lives and reducing thousands of buildings to flaming rubble. 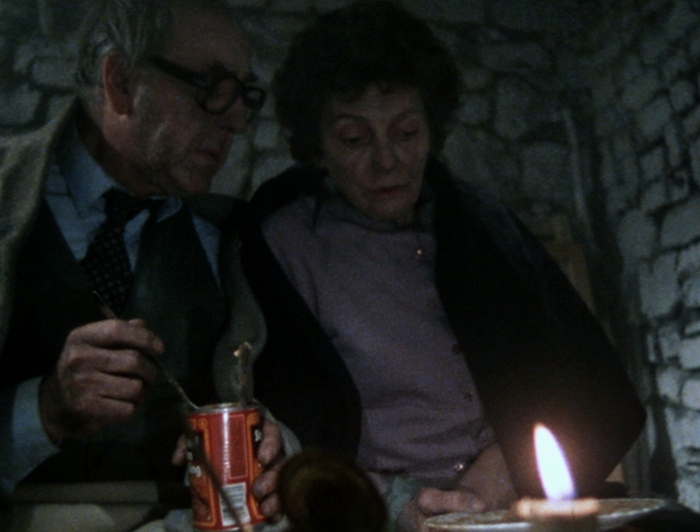 But that's not the half of it: During its final 60 minutes, Threads lingers on its surviving characters as they navigate the charred landscape, eating whatever scraps they can find while succumbing to everything from radiation poisoning to brutal weather conditions. Years pass by and, though sunlight peeks out through heavy clouds of dust and debris, it brings increased ultraviolet radiation due to holes in the ozone layer. 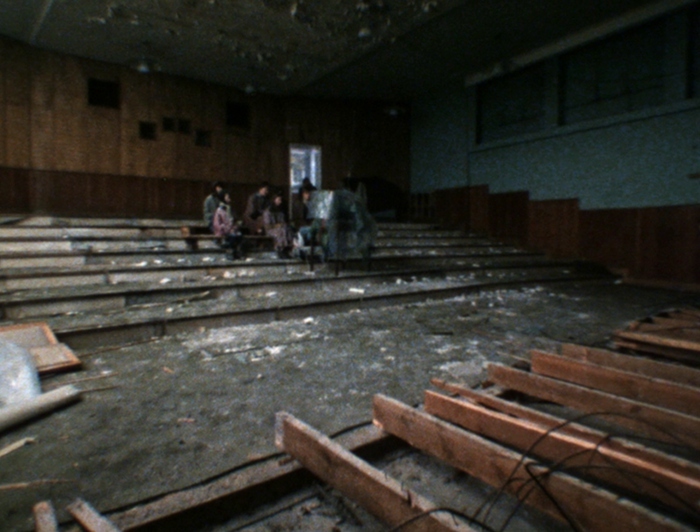 One of the last remnants of the film's opening moments is ten-year old Jane, daughter of Ruth and Jimmy, who's just looking for a reasonably safe place to give birth after being assaulted by looters. Anyway...worst date movie ever, but it's no accident that Threads is a supremely effective film that's easy to admire even if you're repulsed by it. The film's fearless approach to its subject matter pulls absolutely no punches from start to finish. The characters, portrayed by either first-time or relatively unknown actors, are completely believable from top to bottom (and some, like Karen Meagher, were personally involved with the Campaign for Nuclear Disarmament years before the film was first conceived). The director's previous experience with the subject matter was a natural fit as well: obviously influenced by Peter Watkins' landmark 1965 television drama The War Game, Jackson was also responsible for a nuclear technology-themed episode of the British science program QED in 1982. Yet nothing adds to its effectiveness more than the terrific production design and sense of urgency; the latter is amplified by the fact that Threads was filmed guerilla-style in just 17 days on a modest budget of roughly 300,000 pounds. So while it's certainly not a film you'll want to revisit regularly, Threads has lost none of its staying power during the last three decades -- and in some respects, remains terrifyingly relevant. Luckily, Severin Films has done it justice on Blu-ray: though its A/V presentation is somewhat questionable (likely exacerbated by Threads' 16mm roots and plenty of stock footage inserts), a number of outstanding bonus features provide valuable layers of context whether you're a seasoned fan or entirely new to the film. Without question, they deepened my appreciation for this dramatic, ugly, realistic, nightmarish beast of a production. Presented in its original 1.33:1 aspect ratio, Threads is advertised as being "from a new 2K scan", although source elements are not specified. Either way, this 1080p transfer is passable at best: the film itself was shot in 16mm with a lot of stock footage inserts, some of which are shown via television broadcast. Colors appear (accurately) drab, shadow detail can be very limited at times, and overall textures run on the soft side. Dirt and debris is easily spotted. On-screen text is somewhat fuzzy and displays mild judder. That said, it's quite possible that Threads was never meant to -- or at least can't possibly -- look pristine, and I'd rather have a consistently grim image than one that varies dramatically. If nothing else, this lack of fidelity suits the subject matter and obviously improves upon previous home video releases. NOTE: Some images from this review are sourced from Ian Jane's write-up of Threads for Rock! Shock! Pop! The DTS-HD Master audio, presented in its original mono as a split 2.0 track, actually fares a little better for the most part. 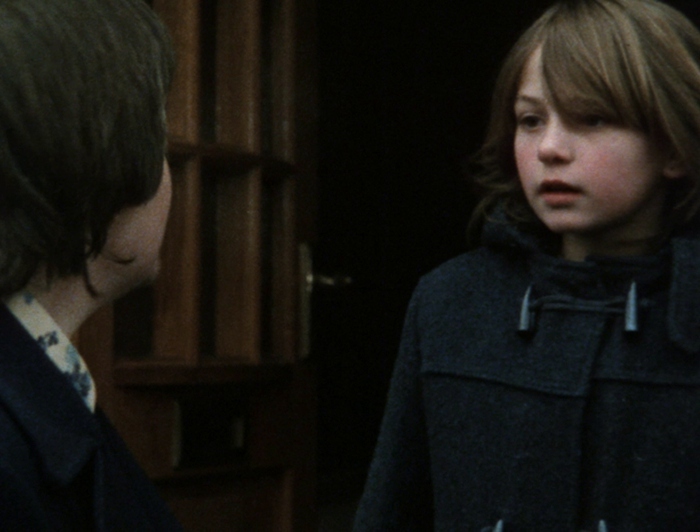 Dialogue is relatively clear and easy to understand, despite the film's modest budget and the presence of heavy regional accents and slang on many occasions. Background effects, voice-over-narration, stock footage, and other variable elements sound as consistent as possible with no obvious defects to speak of. Naturally, there's not a great deal of dynamic range, depth, or low frequency, but what's here gets the job done admirably well and fans shouldn't be disappointed. Optional English subtitles -- not advertised on the menu or packaging -- are also included during the film only, which is a nice surprise. Not exactly the most polished interface, unless Severin was attempting to emulate Threads' lo-fi aesthetic. Either way, the navigation is smooth and simple with separate options for chapter selection and bonus features. This one-disc release is housed in a standard keepcase with no inserts. A limited edition is also available for $10 more -- but as far as I know, the only difference is a lenticular slipcover. Plenty to choose from, and undoubtedly the saving grace of this Blu-ray. First and foremost is a new Audio Commentary with director Mick Jackson, moderated by writer Kier-La Janisse and Severin Films co-founder David Gregory. It's a well-organized, entertaining, and informative track; topics include extensive research before developing the film, the Cold War, fallout shelters, The War of the Worlds, working with screenwriter Barry Hines, depicting a true nuclear winter, the fragile nature of society, finding the right stock photos and footage, and Jackson's late transition to Hollywood filmmaking, to name a few. Three separate Interviews with cast and crew members are up next. "Audition for the Apocalypse" (9:40) sits down with actress Karen Meagher ("Ruth Beckett"), "Shooting the Annihilation (8:37) catches up with director of photography Andrew Dunn, and "Destruction Designer" (9:44) features production designer Christopher Robilliard. Among other topics, these three speak about their involvement in the Campaign for Nuclear Disarmament, meeting Mick Jackson, the film's reception, organizing the production and shooting guerilla-style in only 17 days, bad weather, the spirit of the cast and crew, creating an appropriately bleak environment, Fidel Castro and the Cuban Missile Crisis, and creative cost-cutting measures. Keeping up with the retrospective theme is "Stephen Thrower on Threads" (30:13), a video appreciation by the English film historian that focuses on the film's public reception and its unique place during a paranoid era and, of course, how its underlying themes remain relevant today. Other subjects of discussion during this piece include the BBC's Radio Times feature, Peter Watkins' landmark 1965 television drama The War Game, Mick Jackson's earlier television work (specifically, the QED documentary "A Guide to Trmageddon"), the early 1980s political climate, comparisons to Nicholas Meyer's The Day After, and much more. It's a very well-done piece that provides a lot of context with supportive video clips and photos. Last up are Threads' US Trailer (2:21) and a Re-release Trailer (2:21) that doubles as an ad for this Blu-ray. Both effectively convey Threads' dramatic power and largely let the film clips speak for themselves. Bleak, unflinching, and incredibly powerful more than 35 years later, Mick Jackson's Threads is one of the most memorable and courageous portraits of life before, during, and after a world-changing nuclear attack. Shot guerilla-style in just over two weeks, it features outstanding performances, unforgettably gruesome images, and a convincing atmosphere that effortlessly blends realistic drama with a documentary-style approach. Severin Films' Blu-ray offers a decent (if not slightly questionable) A/V presentation, while the excellent bonus features easily push this into "must-own" territory. Very Highly Recommended.